YESTERDAY we highlighted how a crucial government meeting takes place in November in China. This could well outline the blueprint for economic reform over the next few years. A major challenge facing China’s new leaders is the unsustainable surge in debt since 2008 – a problem we have been highlighting for several years now. Today, in the first of two blog posts on this issue, we look at he extent and nature of the debt problem. 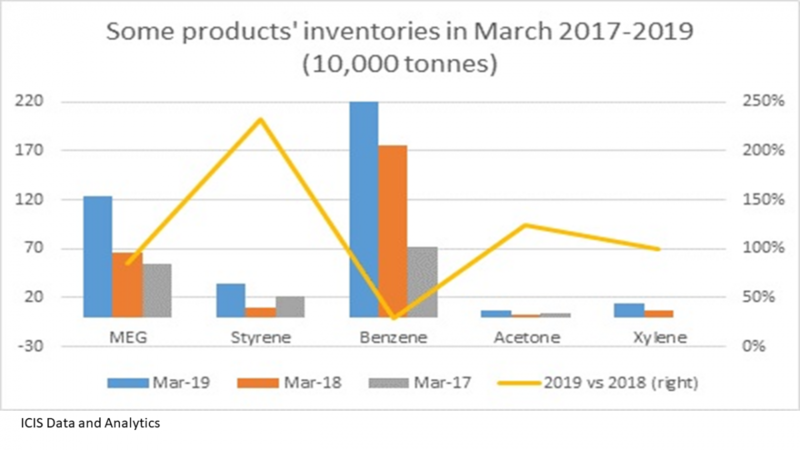 Tomorrow we will consider potential outcomes, or scenarios, for the chemicals industry as reforms are stepped up following the November meeting. READ this interview with Fitch Ratings analyst Charlene Chu, underline just about every paragraph, print it out and stick it on your boardroom wall. And then the next time a colleague in your chemicals company makes comments about how China’s financial sector is sound, use the document to challenge her or his views. People are so focused on the withdrawal of quantitative easing (QE) in the US that they have missed what has been, perhaps, the largest credit binge of all time. At the end of 2012, China’s credit-to-GDP ratio was 200% – 70 percentage points higher than in 2008. 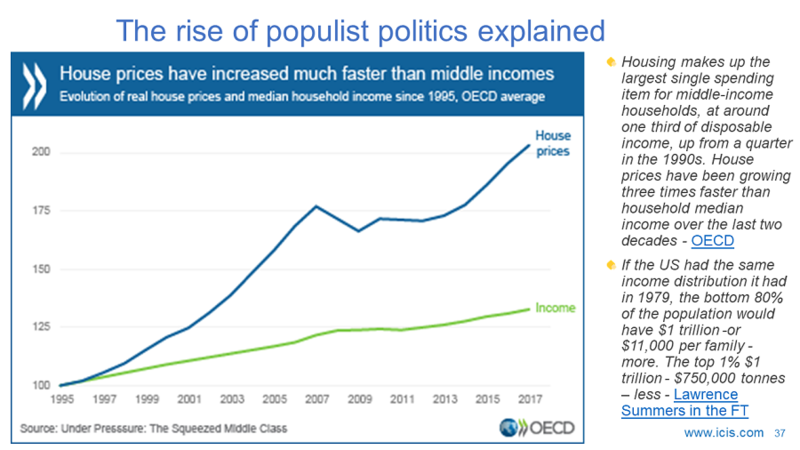 If you look at what happened in the UK or the US from 2002 to 2007, or in Japan in the late 1980s or in South Korea prior to their crisis in the late 1990s, the increases in their ratios were all roughly 40 to 50 percentage points. 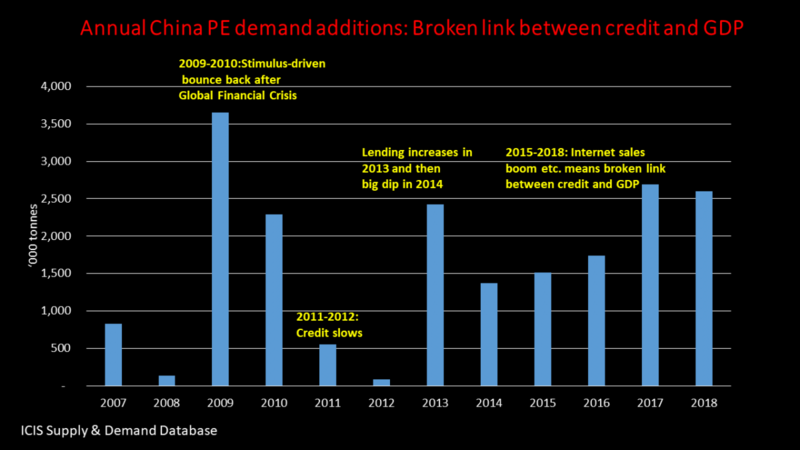 From the end of 2008 until the end of 2013, China’s banking sector assets will have increased about $14 trillion. That’s the size of the entire US commercial banking sector. There is tremendous confidence in the ability and the willingness of the Chinese Communist Party to bail everyone out. But as the system gets bigger and bigger, there are more questions about how feasible that is. 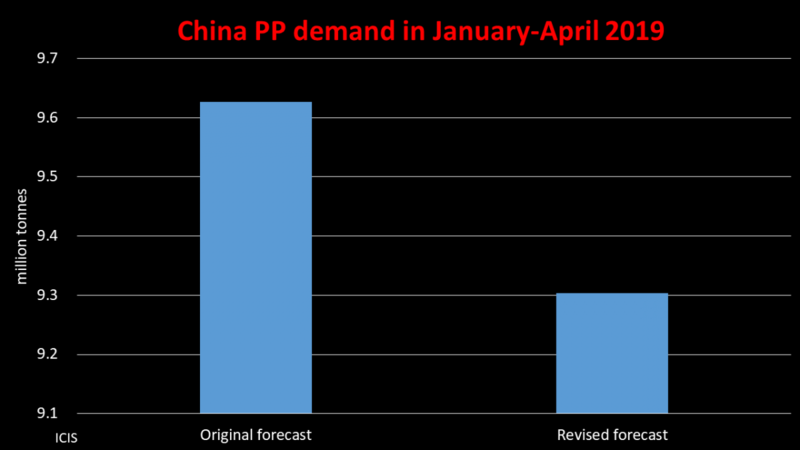 On top of all of these financial system issues, China’s growth model is peaking out. A few years ago nominal GDP growth in China was in the mid-teens. In that type of environment, problems can easily get papered over. It’s only when growth slows that the challenges really start to surface, which is happening right now, making China susceptible to a major financial crisis. But an advantage of the Chinese system is that a crisis is not pre-ordained because of the high level of domestic deposits resulting in low dependence on foreign exchange, and a closed capital account. Close links between state-owned banks and state-owned enterprises mean that there is a lot of tolerance for bad debt. But, as highlighted above, the flip side of this advantage is that imbalances can go on for far too long. The shadow-banking system is a huge “black box”. Nobody knows the extent of bad debt within this system because of the proliferation of small-scale lenders outside government control. This informal lending sector is undermining the health of the big state-owned banks, as their wealth-management products are part of the shadow-banking system. This video from Simon Rabinovitch of the Financial Times is worth a view. This introduces the first of a series of very-important articles by Rabinovitch, which were published last week. In that first article, he wrote: “For most of its past 30 years of growth averaging 10.5%, China did not rely on credit. But it has become ever more reliant on debt since the global financial crisis, drawing on banks, bonds and an array of lightly regulated institutions to keep its economy roaring. “This debt dependency has put China at a dangerous crossroads. If the government is serious about containing financial risks, growth may slow sharply as it weans the country off debt, burdening the global economy. 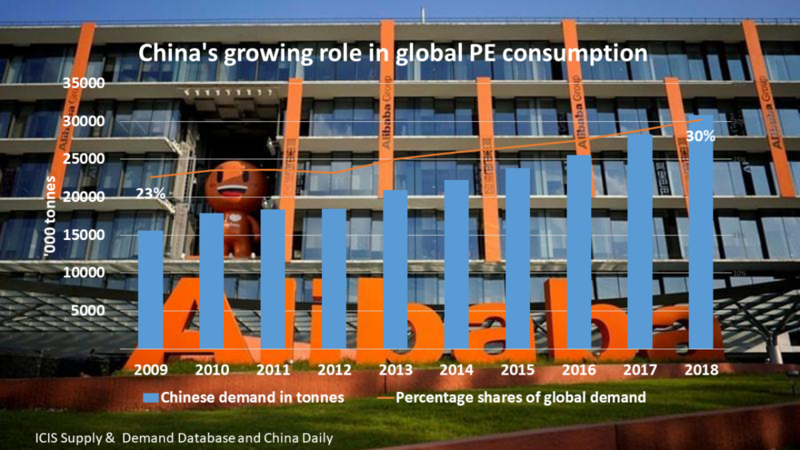 In his second article, he said: “The rise in Chinese government debt levels has gathered more attention in recent years, but the increase in corporate debt has been even bigger. The money owed by Chinese companies shot up from 90% of gross domestic product in 2007 to 124% of GDP, or Rmb64tn, at the end of last year, according to JPMorgan. 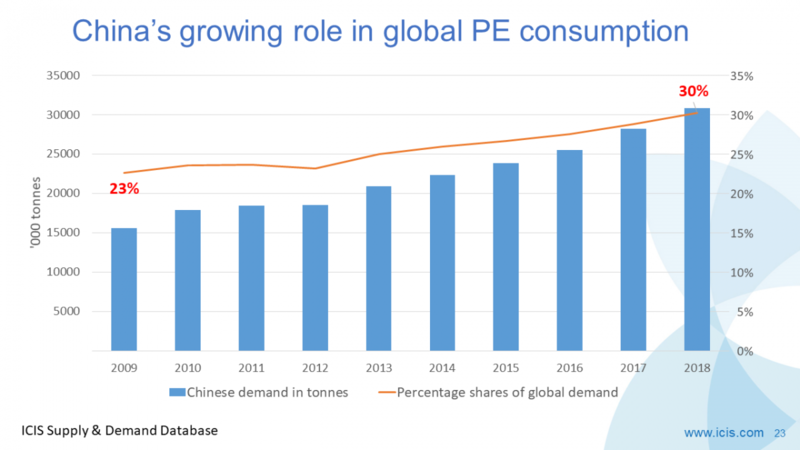 So far this year, growth has been artificially boosted by some extremely shaky borrowing practices that have papered-over the cracks in China’s financial system. 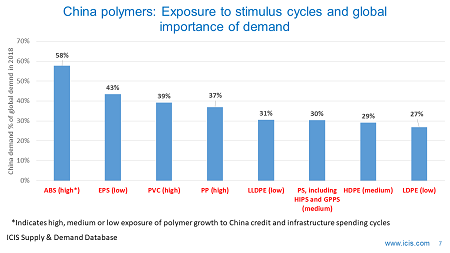 In this ICIS Insight article, we have summarised how some of these practices have distorted polyethylene (PE) demand. 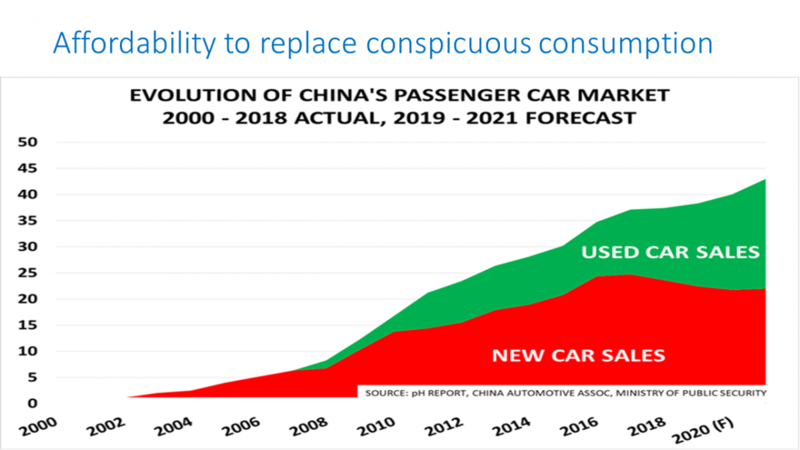 Rabinovitch added that a car parts manufacturer was being paid by his clients – some of the biggest Chinese car makers – in promissory notes guaranteed by banks and redeemable for cash at maturity, usually in about six months. That meant that the car-parts maker didn’t have enough cash to pay his suppliers unless they also accepted promissory notes. “There are bright spots [in China’s economy], of course,” said Merryn Somerset Webb, editor-in-chief of MoneyWeek in this third article from the Financial Times. “Everyone’s offering 0% financing now and in some cases buyers end up with their car for free. How? The buyer pays for the car but with the guarantee of the money back in two years. The seller invests the money in the shadow banking system where he hopes for returns of 60% a year or so before selling up and giving it back. The question now, as we shall discuss tomorrow is: What might happen post-November?